I was recently sent David Baddiel's debut children's book to review. Barry Bennett hates being called Barry. In fact it's number 2 on the list of things he blames his parents for, along with 1) 'being boring' and 3) 'always being tired'. But there is a world, not far from this one, where parents don't have children. No that's far too random for something so big and important. In this world, children are allowed to choose their parents. The title the Parent Agency was interesting, it totally made me want to read the book so much! My favourite characters are secretary one and secretary two. It was funny when they wrote that Barry was fussy because Barry was looking over their shoulder as they were writing and they didn't know he was there! One of my favourite lines was this : "Bum! "said Barry loudly,"Bum bum bum bum bum bum!". It was so humorous! So hilarious! I also think the names of the sweets were weird, especially A Bomb. The story went wild when I saw Barry was in a coma! Come on, I didn't know it was coming so I was shocked. All in all it was an extraordinary and delightful story. I loved it. I think everyone should read this book! Elise managed to finish the 383 page book in just two days, I think this shows just how much she enjoyed it. When I managed to pry the book from her hands, I got stuck in and had a read myself. The writing flowed well and the comedy was there, although for myself he humour did seem a little forced at times. However trying to see it through a child's eyes I can see many kids chuckling away. Fast paced, fun and most certainly entertaining. I've honestly not heard my daughter laugh so much when reading a book before. 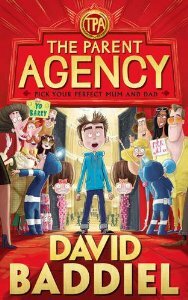 I've read that another children's novel will be written by David, if that's the case, I will certainly be purchasing it!! I saw his interview on The One Show last week - am now very intrigued by this one!